My friend Joe was facing great challenges in his job. Demand had recently spiked for the product his company manufactured. At almost the same time, the supplier of a major component had problems with its manufacturing process, and stopped shipping until the problem could be corrected. The pressure was on to meet deadlines that were looming. On top of all this, Joe’s boss was difficult to work for, and several co-workers had quit or transferred to other departments, leaving Joe’s department short-handed, short-supplied, and his boss even more short-tempered than usual. Joe started having nightmares. Have you ever faced an overwhelming challenge that scared the living daylights out of you? After 600 years from God’s promise to Abraham to make him a great nation, the children of Israel were ready to move into the Promised Land. But there was a big problem. Wicked people were already living in the land of Canaan, and some of them were giants. The prospect of facing these giants in battle would be enough to give anyone nightmares. God miraculously dams up the Jordan River, just as he parted the Red Sea when Moses led this people out of Egypt. Then God delivers Jericho into the Israelites hands by knocking down its walls with nothing stronger than shouts and trumpets. 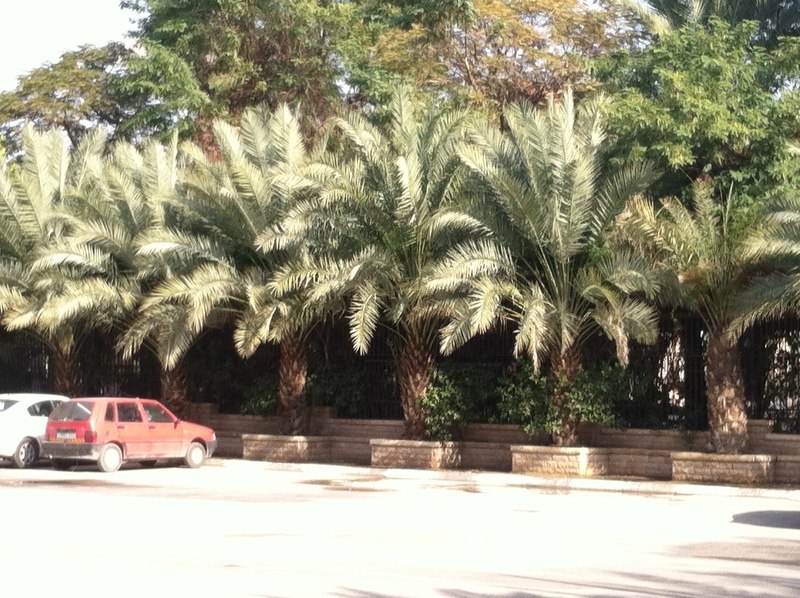 Even today, the fertile valley surrounding the city of Jericho produces a large percentage of the fruits and vegetables sold in the markets at Jerusalem. Dates, figs, bananas, cauliflower, grains, they all grow in abundance. Jericho was not only a strategic military target because it lay at the edge of the wilderness, but because it was a great resource of food to feed a hungry nation. The first archaeological excavations of Tell-es-Sultan (the ancient fortified city of Jericho) were made by Charles Warren in 1868. Through the 20th century, more archeologists would continue to excavate the area. One of the most significant discoveries of the archaeological excavations is the Stone Age tower on the western perimeter of the site. The tower is about 28 feet high, with an internal staircase of 22 steps. 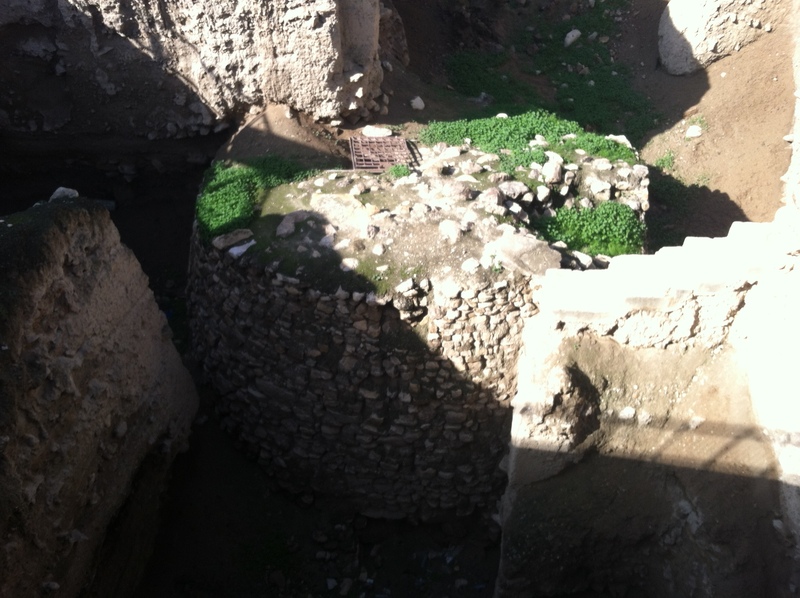 It was one of four towers set into the thick walls of Jericho, probably before the pyramids were built in Egypt. Some think that Jericho is the oldest city in the world. As strong as those 12-foot-thick walls were, they were no match for the army of God. As soon as Joshua and his troops took over the city of Jericho, they moved on to Ai. From there, Israel defeats 5 kings and takes the cities in the south. 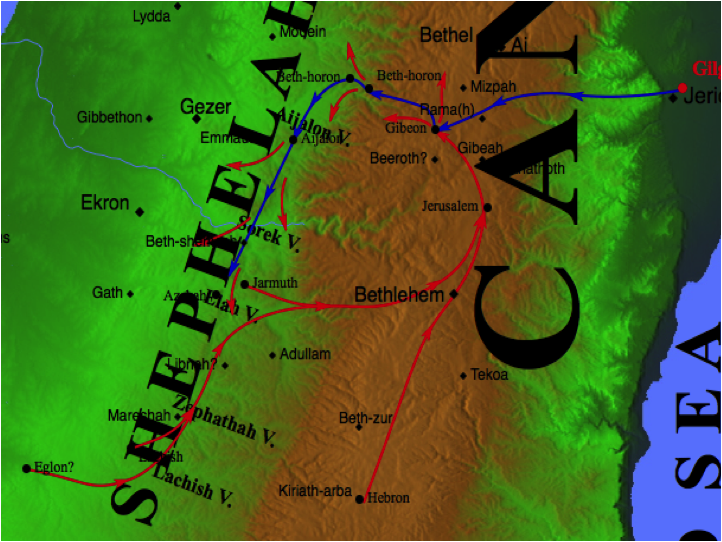 The blue line on this map shows the path the Israelites followed as they headed west and south. 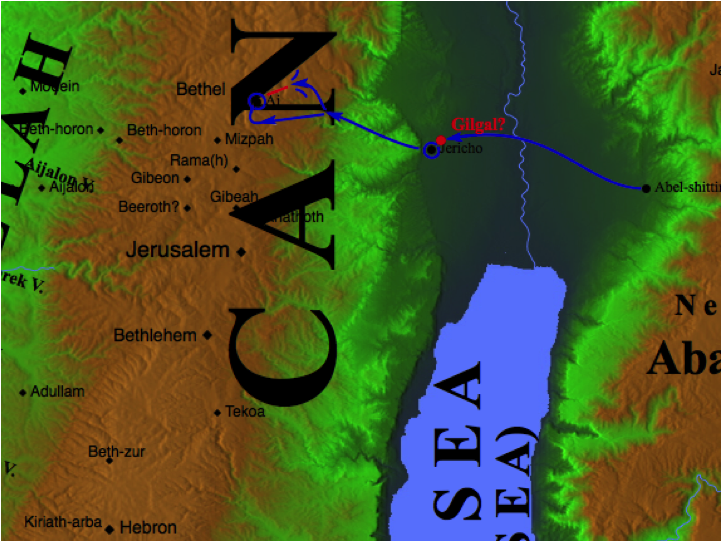 The armies of Canaan came up to meet Israel – those are the long red lines – but these armies were defeated and chased out of the cities they were trying to defend, and they were completely destroyed. 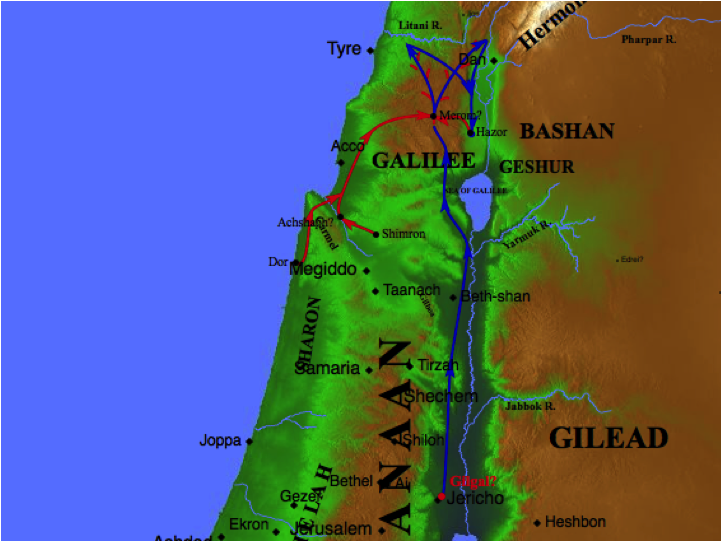 Then Israel moved northward and defeated 14 kings in the northern areas up around Galilee. The Canaanites, the Amorites, the Jebusites, and all the other peoples of the land worshiped idols, and that worship included using prostitutes and sacrificing (burning) children to various gods. (Deuteronomy 12:31 and 20:18; Exodus 34:15-16) God had given them 600 years to turn away from these detestable practices, but they hadn’t. Even more importantly, God wanted to make Himself known among the nations. At least 19 times in the Scriptures God declares this as His mission. God told Abraham that all the nations of the world would be blessed through his offspring. God wanted to establish his name, in order to give the Israelites an identity in an identifiable land, and to make himself known to the surrounding nations. So the Israelites each went to their own inheritance, to cities that had already been built for them, to vineyards and farms that had already been planted for them. And they had peace. Joshua continued as their leader until his death. But Joshua knew that we humans are most vulnerable when things start going well, and we let down our guard. So as he prepared for his own death, Joshua called the people together to remind them of the covenant promise they had made with God, to serve him only. The question is, whom will you serve? God has acted. Just as God acted on behalf of the Israelites by driving out the people from Canaan who would not serve him, God has already acted on our behalf. He has made it possible for our sin to be forgiven and our lives to be made whole through the death and resurrection of his Son Jesus. As Joshua gathered the people together, he demanded two things from them. First, he reminded them that they were to enter into the proper relationship to God. Serving the Lord had to be a total commitment, and that word ‘total’ meant complete, as perfect as a lamb brought for sacrifice must be. Second, they were to rid themselves of all other claims to lordship over them. They were to be faithful to God, and only to God. But this was not the choice Joshua presented to Israel. He was not asking them to select the most convenient or appropriate deity, the way you would choose a pair of shoes to wear for a particular activity. He was asking them to commit to one God, and only one God, the God that had delivered them, guided them, protected them, and conquered other nations to give them a home. Joshua asks, “Whom will you serve?” at the precise moment when Israel comes into a time of peace in a ready-made paradise, a fruitful land flowing with milk and honey. It is just at this moment, when Israel should be devoting itself to praising and thanking God, that they are most vulnerable to falling away. And we are no different. All too often, we who claim to be Christ followers find ourselves pledging our whole hearts to God, only to be distracted by the first temptation that faces us. We find ourselves trying to worship God and the material world. We like being Christians on our own terms, as it suits us. We naturally call on the Lord when we are in trouble, but when things are going well, we tend to rely on our own strength, our own direction. We like to be our own lord. Too often, the times when we should be living lives of gratitude and praise for God’s goodness are the very times we forget about God completely. Like the nation of Israel, we discover that it is precisely when things are going well that we are most vulnerable to the temptation to turn away from God and worship other “gods” like wealth or popularity or our own selfish desires. But Jesus calls us back to God, just as Joshua did. It would be centuries before another “Yeshua” would call all people to God through his own death and resurrection. This Yeshua would also urge his followers to make a full commitment to love and serve God in all circumstances. He makes that call to us now. In the book, Renovate or Die, Bob Farr describes a problem that the church brought on itself during the 20th century. Farr calls it “playing church.” Instead of raising up committed followers of Jesus Christ whose deep faith offers healing and hope to others, the church has cultivated “consumer Christians,” people who think that holding an intellectual belief in Jesus and showing up occasionally for worship is all that being a Christian requires. For Consumer Christians, faith is a transaction – they go to church to feel better about themselves, so choosing a church is more about meeting their own needs than serving their Lord. So the church markets itself to these consumers, and never helps them develop into faithful followers of Jesus Christ. And frankly, it’s easier to work at being appealing than it is to help people along the path to discipleship. Playing church is easier than being church. Joining and showing up and maybe even participating in committees or work groups doesn’t require as much of us as allowing Christ to transform us from the inside, to change our priorities and ways of thinking so that Jesus is at the very center of everything we do or say. This entry was posted in Discipleship, Sermons, The Story, Uncategorized and tagged fully devoted follower of Jesus Christ, Jericho, Joshua on October 25, 2015 by pastorsings.